New aerial imagery has now been added to the water resource pages and to the Advanced Mapping application on the Sarasota County Water Atlas. 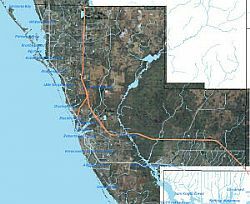 The source of the aerial photographs is the Southwest Florida Water Management District, which uses the images for land use analysis. The imagery was obtained from the SWFWMD as individual cells and mosaicked together based on the extent of the Atlas boundaries. Photos were taken between December 1, 2010 and March 15, 2011, between the hours of 10 a.m. and 2:30 p.m. on cloud-free days to minimize shadows.